Oh hamantaschen, I just can’t quit you! I know Purim is technically, and by technically I mean actually, over, but much like Spring Break in Canceezy ’02, I just don’t want the party to end! Luckily, with SXSW on the horizon, it doesn’t have to. Win. Boatloads of hipsters have already transcended upon our fine city in search of free booze (quintessential Purim) and tchochkes (who doesn’t love free goodies?). So far I managed to scrounge up two bandanas, a baker’s dozen or two promotional and yet adorable buttons, and some kettle corn popcorn that tasted just delightful in the wee hours of Sunday morning. 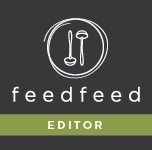 Do you know what else tastes delightful? 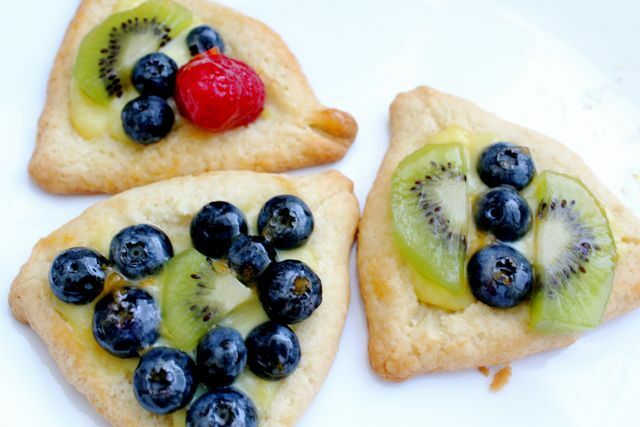 These hamantaschen tarts (does the word tart make any one else giggle like a school girl? Just me?) I got the idea for them and just had to make them right away. 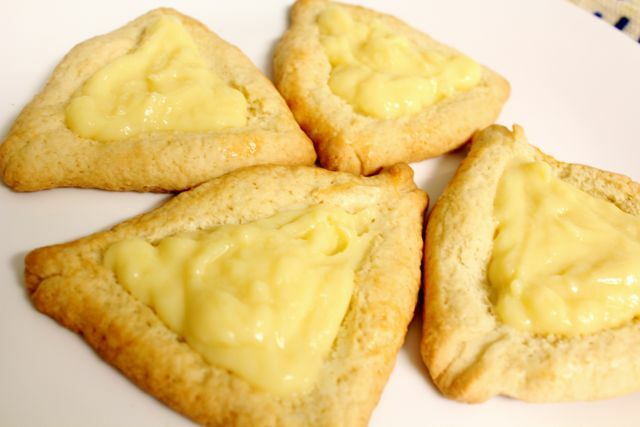 I used normal hamantaschen dough, but next time I would purchase a triangle tart pan to make them more legit. Either way, these are delicious! Plus fruit = healthy. Win again! 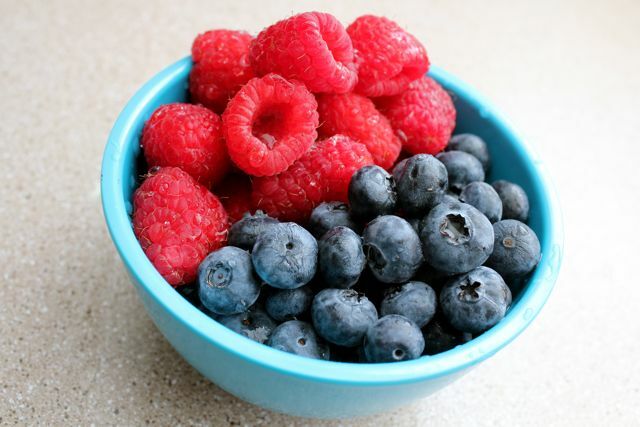 Plus some fresh fruit of your choice! Here is my choice, and some kiwi. First, make our dough. 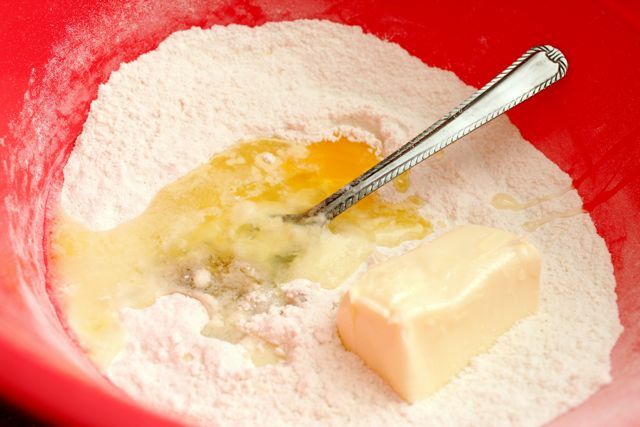 Combine flour, baking powder and salt and then add in the butter, vanilla, egg and OJ. 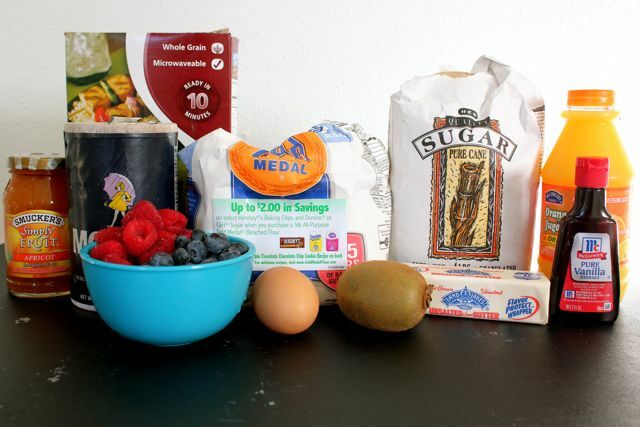 Roll into a ball and refrigerate for 1 hour. While your dough is chilling, let’s make the pasty cream. What is pastry cream you may ask? It is pretty much the best pudding ever. Eeeeever. 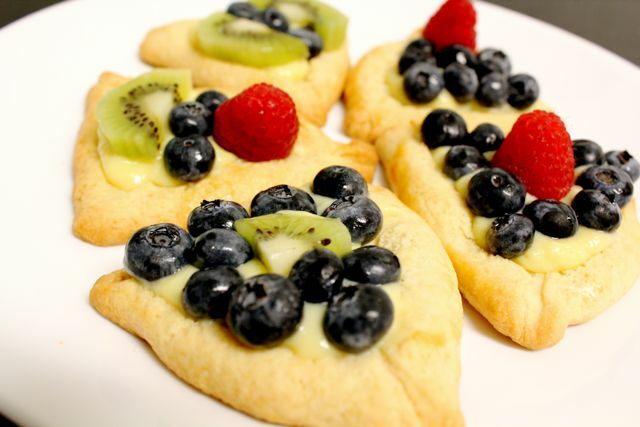 Perfect for filling eclairs, or in this case, fruit tart hamantaschen! It’s easy to make too. 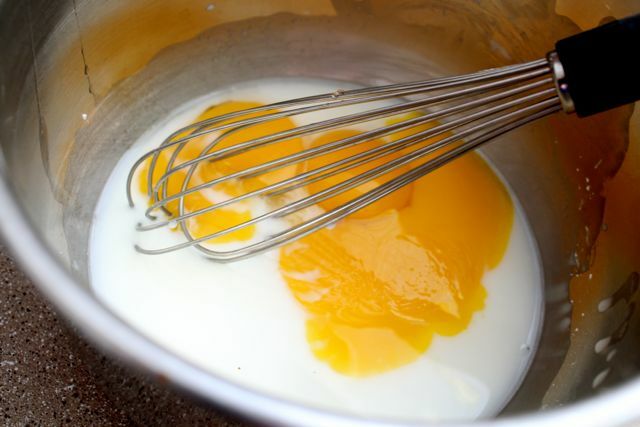 First up, whisk up half your milk, sugar and the cornstarch with all the egg yolks. 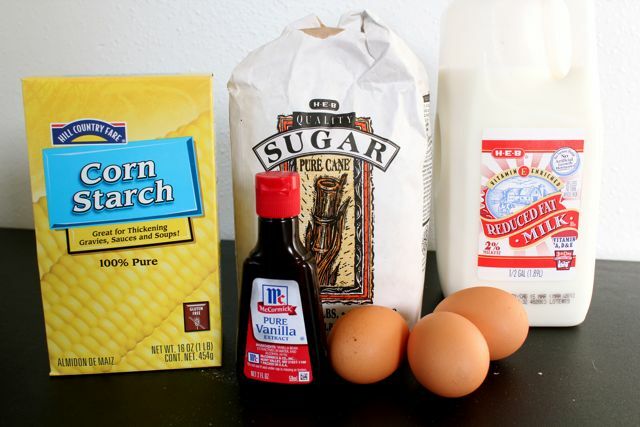 Whisk this every so often so it doesn’t sit too long. Then, add the rest of your milk and sugar to a pot and bring to a scald. 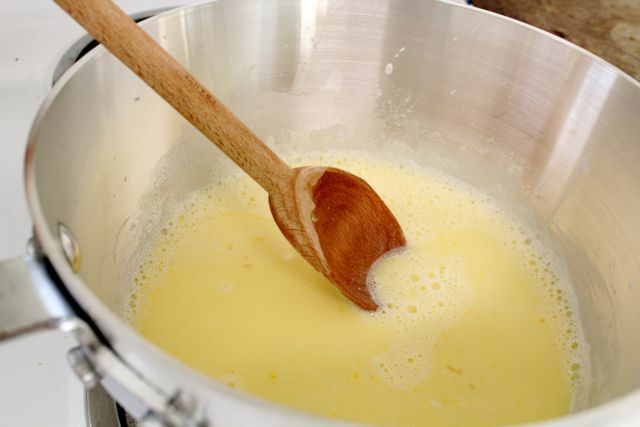 After your milk is scalded, temper into the egg mixture, whisk, and they put back in the original pot you scalded your milk in. 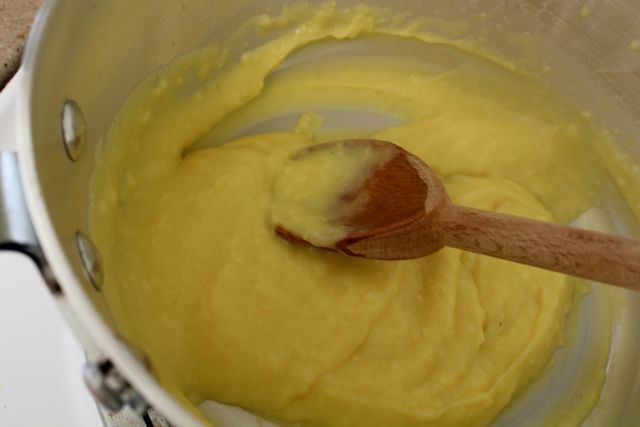 Stir on a low to medium heat until your pastry cream gets thick. Add the vanilla and strain onto a piece of saran wrap. Wrap her up and refrigerate until ready to use. 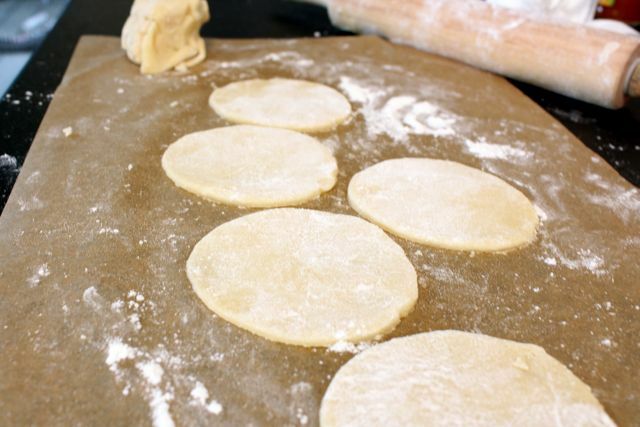 One your dough is ready, roll it out and cut out circles with a 2 or 3 inch cutter. Then fold the sides to form a triangle and push the side up a bit to make a wall. 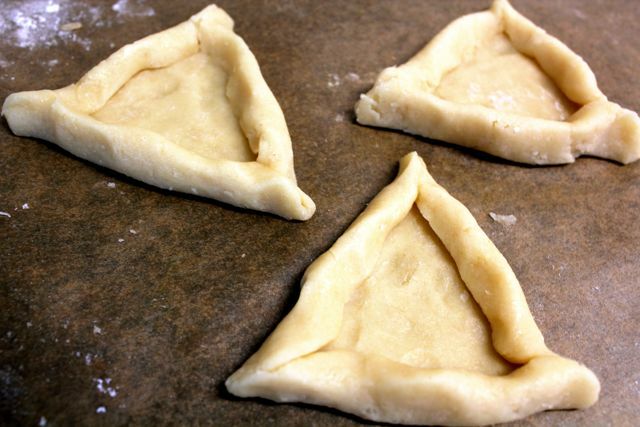 Brush each hamantaschen with an egg wash, put a piece of parchment paper in each one and fill each one with rice, making sure to press into the triangle shape. We are going to blind bake these to keep the middle area flat as a surface for our pastry cream! Blind baking is basically putting a fake filling so the tart or pie will keep its shape. I used rice. Bake until the sides start to brown, or about 7 minutes. 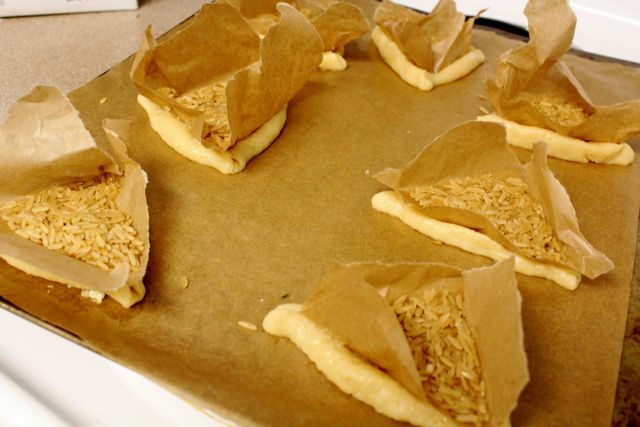 Then remove the rice and parchment paper and bake for about 5 more minutes until the tarts are golden brown. It’s hard to tell in the above photo, but the indents stayed! Now we have a vehicle to get the pastry cream in our bellies. 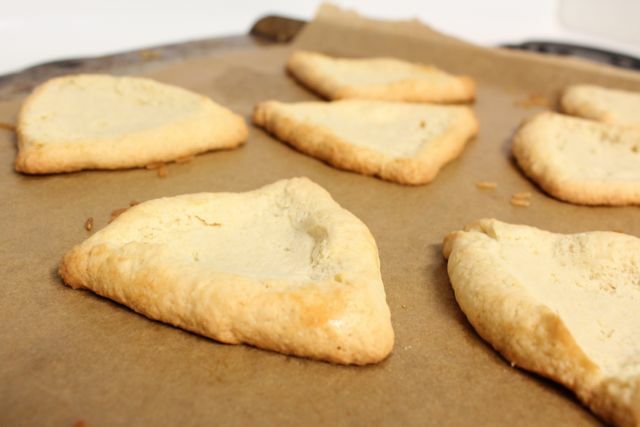 If you didn’t use the rice blind baking, you would just end up with poofy triangle shaped cookies. Now just fill your hamantaschen tarts with pastry cream- I piped it in but you can just use a spoon too. It doesn’t have to be super pretty since we are covering these suckers with fruit! Sorry for that lame photo. I made these at night! Darn you daylight! 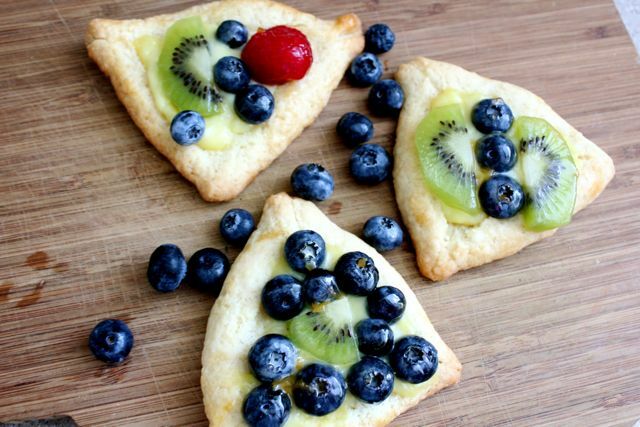 Now just arrange your fruit on the tarts. I heated up some marmalade in a saucepan to brush on top to create a shiny glaze. Ta da! There you go. These are best eaten the same day or within one day. See you next year, Purim! 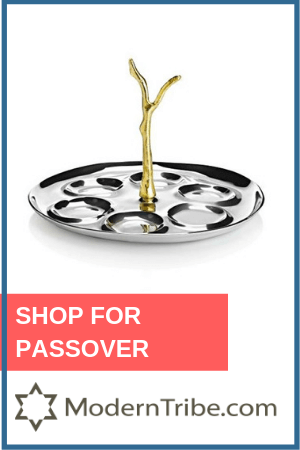 Onto Passover- pass the matzah! 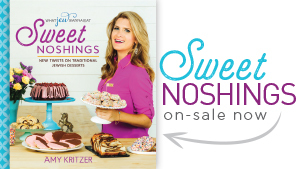 A fun dessert hamantaschen for Purim or anytime! 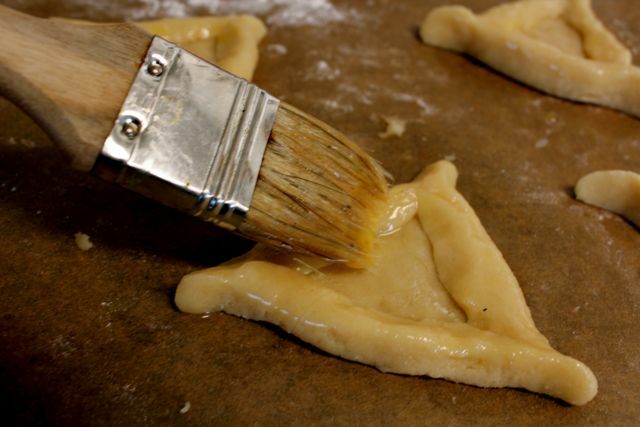 To make the hamantaschen, combine the sugar, flour, baking powder and salt. 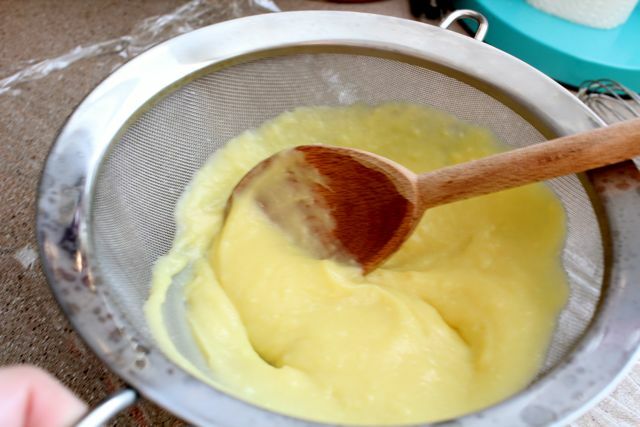 Add the butter, egg, vanilla and orange juice to dry ingredients and mix with fingers. 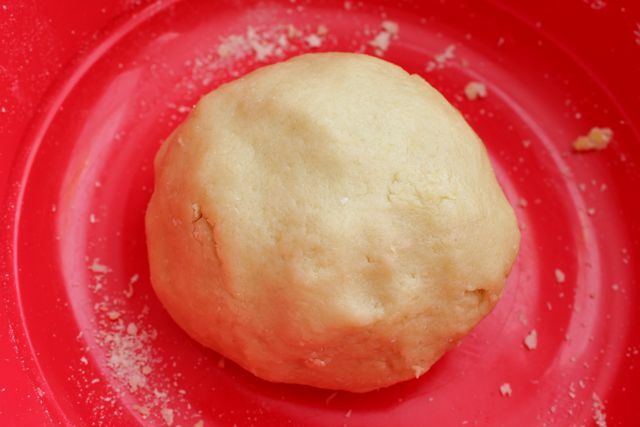 Combine and form dough into a ball. 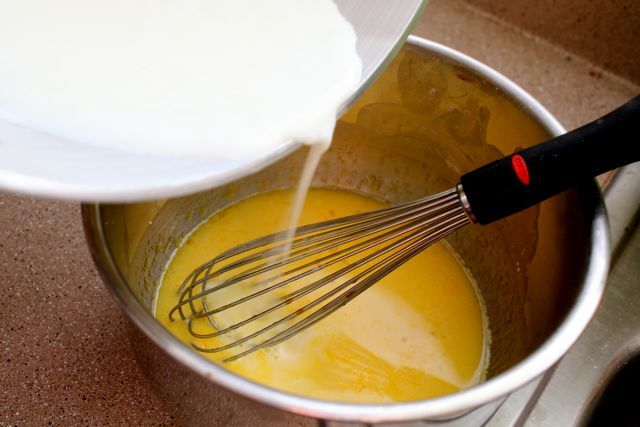 To make the pastry cream, whisk up half your milk, sugar and the cornstarch with all the egg yolks. 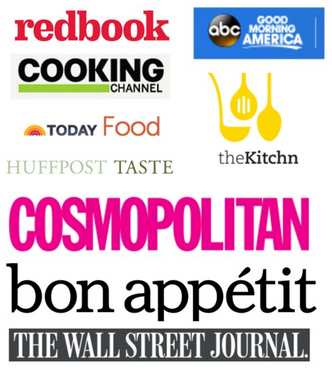 Whisk this every so often so it doesn’t sit too long. 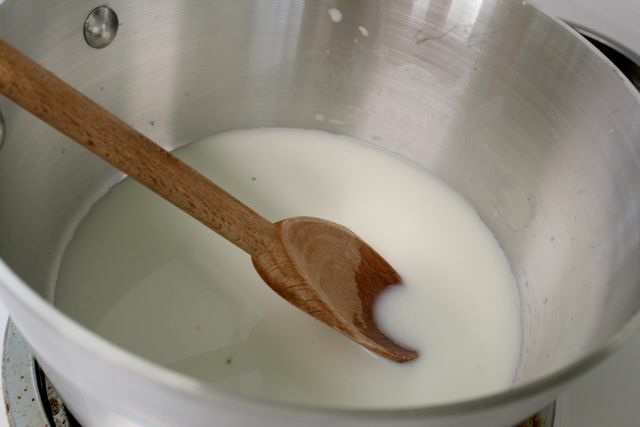 Then, add the rest of your milk and sugar to a pot and bring to a scald. Add the vanilla and strain out lumps onto a piece of saran wrap. Wrap her up and refrigerate until ready to use. Roll dough out, and cut into circles with cookie cutter or wine glass. Now just fill your hamantaschen tarts with pastry cream- I piped it in but you can just use a spoon too. It doesn’t have to be super pretty since we are covering these suckers with fruit! 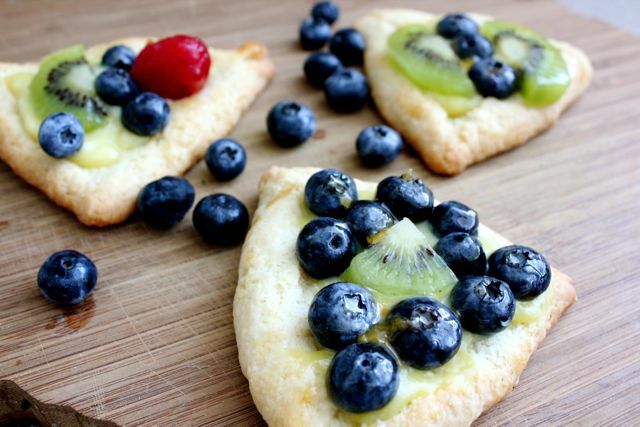 Now just arrange your fruit on the tarts. I heated up some marmalade in a saucepan to brush on top to create a shiny glaze. 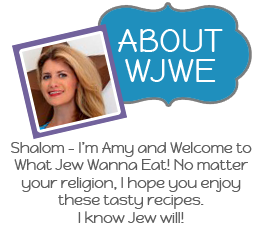 « Mega WJWE Giveaway- a Cuisinart Immersion Blender!! I just love a little “tart.” These look like they are so happy -such an improvement over the prune ones I ate yesterday! You are awesome my sweet. Sure wish I could taste-test these! They look divine! I want to prepare and refrigerate the dough and custard now and bake them tomorrow night. Do you think that would work? Yes that should be fine!